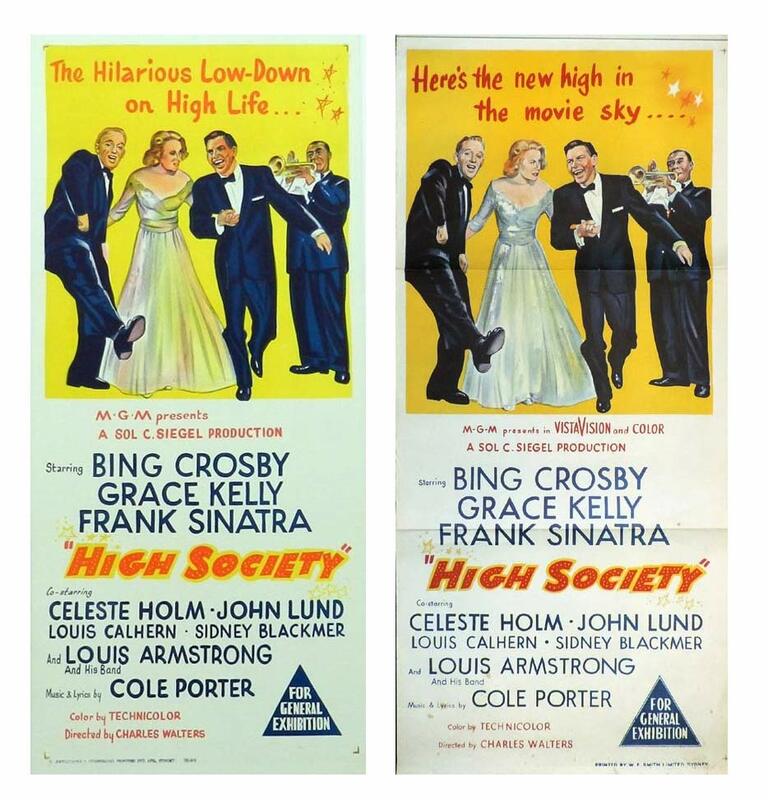 News | Moviemem Original Movie Posters - High Society Australian Daybill - Original or Reissue? A full colour High Society Daybill movie poster, printed by Advertising and Commercial, has turned up occasionally on various auction sites. Up until very recently, that poster was always been considered as the first release. However, one collector, who has been doing significant research into the release dates of Australian posters, thought that an original daybill would surely have been printed by W.E.Smith and not Advertising and Commercial. High Society is one of the great Cole Porter musicals and was first released in Australia in 1957. The collector is convinced, through his research, that Advertising & Commercial printed MGM daybill posters in Australia between December 1959 and early 1962. The problem was that the only full colour daybill that had been seen was the one printed by Advertising and Commercial so dealers and collectors could not be blamed for assuming that the daybill must have been the first release (pictured to the left). However, the collector was recently proven to be correct in his theory when a High Society daybill movie poster printed by W.E.Smith turned up (pictured on the right). The artwork was similar but a little more detailed than the Advertising and Commercial poster. The lettering was slightly different with a reference to "VistaVision and Color". The printers details at the bottom of the poster are for W.E.Smith who still printed daybills at the time of the release of High Society in Australia. The W.E.Smith daybill is quite obviously the true first Australian release in 1957. So what about the Advertising and Commercial Daybill for High Society? Well, my educated guess would be that it would have been produced around 1960 but not later than 1962. The film was highly successful and was certainly re released in Australia but records of the exact re release dates are difficult if not impossible to find. Unfortunately, the Advertising and Commercial daybill will continue to be sold as the original release because many sellers will not be aware of the difference. There are a number of collectors who are actively researching the release dates of Australian posters. The work is time consuming and difficult but will be ultimately be very beneficial to the hobby. Watch this space for more on Reissue daybills that have been previously thought to be original. With thanks to L.Bailey for his research on Australian movie posters. High Society is a 1956 American musical comedy film directed by Charles Walters and starring Bing Crosby, Grace Kelly, and Frank Sinatra. The film was produced by Sol C. Siegel for Metro-Goldwyn-Mayer, and shot in VistaVision and Technicolor, with music and lyrics by Cole Porter. Based on the play The Philadelphia Story by Philip Barry, with a screenplay by John Patrick, the film is about a successful popular jazz musician who tries to win back the affections of his ex-wife, who is preparing to marry another man. The jazz musician encounters additional competition from an undercover tabloid reporter, who is also in love with his ex-wife, who now must choose between three very different men. High Society was the last film appearance of Grace Kelly, before she became Princess consort of Monaco.